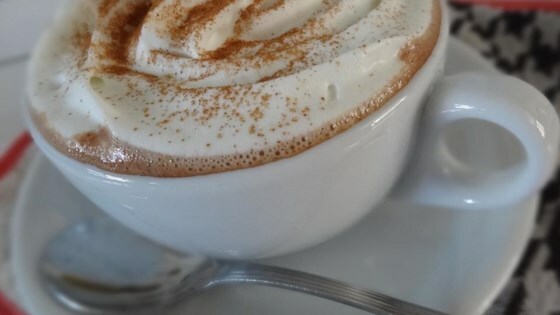 "Rich and creamy pumpkin spice hot chocolate is a great treat for a fall day, quiet evening, or to share with friends and family!" Whisk milk, cream, chocolate chips, and cocoa powder together in a saucepan over medium heat until chocolate chips are melted and hot chocolate is smooth, 3 to 5 minutes. Stir in pumpkin puree and pumpkin pie spice until fully incorporated. Pour hot chocolate into 2 mugs. Top with whipped cream; sprinkle cinnamon and nutmeg over whipped cream. See how to make a delicious homemade pumpkin coffee syrup. It was a little bit too much chocolate. Otherwise the recipe was good and we liked the whipped cream and the nutmeg on the top. I enjoyed this recipe but I did double the pumpkin. Will make again. Love this! I am a pumpkin spice addict so I added 2 1/2 teaspoons of pumpkin puree instead of 1 1/2. Other than that, it was absolutely delicious. LOVED this! I used evaporated skim milk instead of heavy whipping cream, so good! I might try adding more pumpkin puree to make the pumpkin taste stronger. I think you could have added more chocolate and put less chocolate. We put whip cream to add more taste and ground cinnamon.